Dinner last night was easy, fast, cheap and delicious. My favorite kind of meal! This dish is extremely versatile and only requires one key ingredient – Shirataki noodles! Never heard of them? Me either, until I started following the Trim Healthy Mama Plan a few years ago. Shirataki noodles are pretty much miracle noodles! Sounds to good to be true. Shirataki noodles (also known as Konjac/Yam/Glucomannan noodles) are traditional Japanese noodles made primarily from glucumannan, which is a water soluble fiber. Water soluble fiber = I know what you’re thinking – zero everything means zero flavor too, right? That is true, but it also means they will take on any flavor you choose to give them! I see a lot of recipes that recommend using Shirataki noodles in Italian style dishes. I prefer to use them primarily in Asian style dishes, since that’s where they originated. So, dinner last night was an Asian noodle stir fry with an over-easy egg on top! I didn’t have any meat in the fridge and I had very few vegetables – so I improvised! 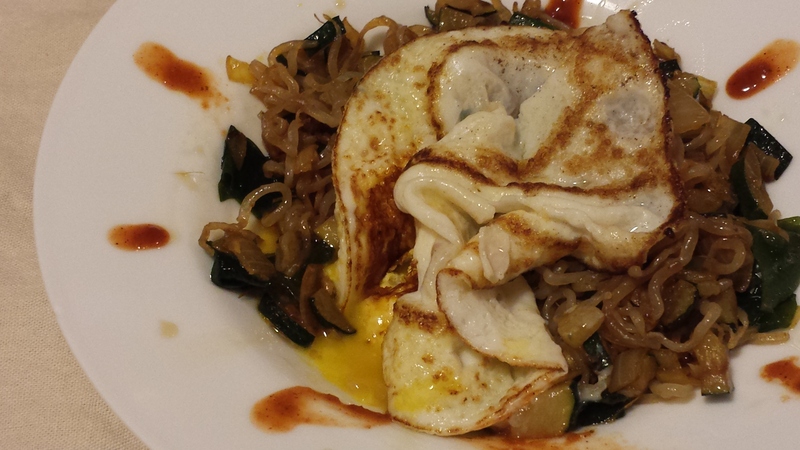 Zucchini, onion, dried seaweed, Shirataki noodles, a few sauces, and an egg. Together – a very cheap and satisfying meal. The key to enjoying these noodles depends on how you cook them. These three steps are important. When you open a package of Shirataki noodles, they have a strong fishy smell. This smell will disappear in the rinsing/boiling process. Nearly any kind of meat or vegetable can be added to this dish. Be creative! Just cut everything small and consider cooking the meat separately and adding it at the end. I think a fried egg is a nice addition (and it was my only protein), but you can choose to use a different protein source instead. As written – this recipe is an S if you are following the THM plan. *Shameless advertisement warning* I used my boyfriend’s Chili Garlic Lime Hot Sauce for this recipe! Here’s my recipe for Asian noodle stir fry – Enjoy! Rinse Shirataki noodles in a colander under cold water for at least 1 full minute. Add noodles to boiling water and cook for 3-4 minutes. While noodles are boiling, preheat a nonstick frying pan over medium high heat (do not add any oil or fat). Drain noodles well and add to frying pan. Dry roast for several minutes until noodles are visibly dry and “squeak” when stirred. Move noodles aside so there is space in the middle of the pan. Add a few tablespoons of butter or coconut oil to the center of the pan. Add diced onions and ginger and saute for a few minutes, until the color starts to change. Add a few more teaspoons of oil if needed and add the diced zucchini. Continue to saute and then stir to combine all ingredients. Add several splashes of Braggs Aminos and hot sauce and stir to combine. Taste and adjust seasoning if needed. Drain seaweed and add to pan. Stir to combine and remove pan from heat. Preheat a small frying pan over medium heat. Add a small amount of butter or coconut oil and melt. Crack an egg gently into the pan and cook until the egg whites are opaque and the egg moves freely in the pan. Carefully flip the egg over and remove from the heat. Serve stir fry with a drizzle of sesame oil and a few extra drops of hot sauce. Top with the fried egg. Enjoy!